High-quality patient care begins with good assessment, but acquiring the necessary skills and experience to make accurate patient assessments can be complicated. No textbook can convey the healthy body sounds heard during auscultation, nor show a live example of a patient demonstrating abnormalities during a visual field test. Fortunately, video resources address these challenges and more, giving nursing students a reliable way to observe nuanced procedures and patient interactions before practicing in a clinical setting. 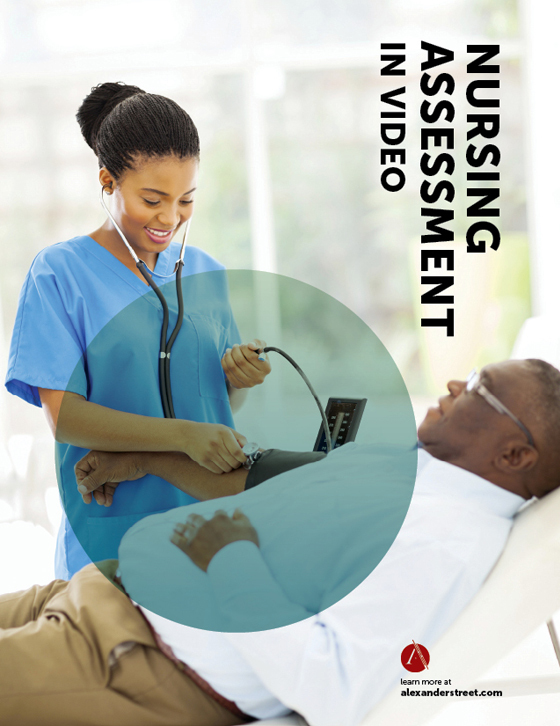 Nursing Assessment in Video is an online database that provides anywhere, anytime access to the best-selling assessment series of training videos from Medcom Inc., acclaimed provider of nursing education programs worldwide. Each title features leading industry experts providing hands-on demonstrations and step-by-step instructions in key assessment areas. And because all content was produced since 2012, users can depend on the collection to deliver the most accurate, up-to-date information available.